Sort archived episodes by clicking one of the topics below. Sort further by selecting a subtopic. Episodes will be ordered by the frequency a term is used. At The Meeting returns with the first of a two part episode on gut health. Drs. Gordon Spronk, Tom Wetzel and in memorial Bob Morrison are joined by Dr. Dana Beckler and Dr. Seth Kranz. In the final episode of this three part series on Mycoplasma hyopneumoniae, the Morrison Group is joined by the University of Minnesota's Dr. Maria Pieters to discuss the determination of day zero and related factors. Back for part two of a three part series, the Morrison Group is joined by Boehringer Ingelheim's Dr. Amanda Sponheim to review monitoring for Mycoplasma hyopneumoniae as well as determining true elimination. The Morrison Group on At The Meeting is joined by the Swine Vet Center's Dr. Paul Yeske in a discussion on the history of Mycoplasma hyopneumoniae herd elimination and practices. Part one of a three part series. This three episode At The Meeting series looking at PRRS type 174 concludes as The Morrison Group, joined by Boehringer Ingelheim's Dr. Reid Phillips, discuss recent Time To Stability research and the latest on PRRS control. Here's part 1 of a 3 part series going deep on Porcine Reproductive and Respiratory Syndrome (PRRS) Type 174 with Dr. Bob Morrison and The Morrison Group on Boehringer Ingelheim's At The Meeting. In this episode the group looks at Restriction Fragment Length Polymorphisms (RFLPs) pattern 174 and PRRS. Here's part 1 of a 3 part series going deep on Porcine Reproductive and Respiratory Syndrome (PRRS) Type 174 with Dr. Bob Morrison and The Morrison Group on Boehringer Ingelheim's At The Meeting. In this final episode of a three part series on Gilt Development, The Morrison Group discusses the value of gilt introduction protocols to maximize genetic potential with Dr. Noel Williams, COO at Iowa Select Farms. Part two of the three part series with the University of Alberta's Jenny Patterson on Managing the Gilt Development Unit (GDU) and reproductive performance. Part one in this three part series features North Carolina State's Dr. Billy Flowers discussing Birthweight Influence on Lifetime Reproductive Performance. At The Meeting's three part series on the impact of FDA's Guidance 209 and 213 continues. 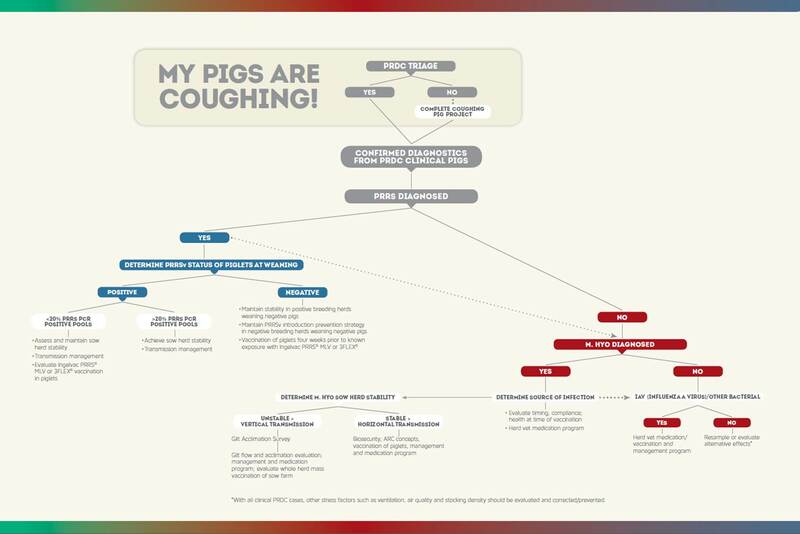 Dr. Peter Davies joins The Morrison Group to discuss the meaning of "judicious use" and it's interpretation in the U.S. and other swine producing counties. Link to Dr. Davies' Leman Conference presentation "Managing Expectations About Antibiotics"
Link to 2015 Leman Conference shared video presentation page. In this At The Meeting Case Series, the Morrison Group along with Dr. Mike Murtaugh (University of Minnesota) discuss the sequence information available on the recent PRRS 1-7-4 strain. The group is also joined by Dr. Sara Hough (Prestage Farms) and Dr. Josh Duff (Maxwell Food) to discuss PRRS 1-7-4 breaks, clinical impact of the virus and control strategies. The Morrison Group returns in part 1 of a 3 part series to look at Porcine Epidemic Diahrrea Virus impact on the US swine herd. Today's discussion centers on the Swine Health Monitoring Program. At The Meeting returns with an update and perspective on PRRS management with Dr. Tim Loula, Swine Vet Center, St. Peter, MN. Dr. Loula brought the idea of local regional control to pork operations. This conversation looks at the specifics of one regional project with respect to PRRS management. Dr. Bob Morrison's At The Meeting digs deep on Porcine Epidemic Diarrhea Virus (PEDV) diagnostics and field findings as we join the Morrison Group roundtable discussion. Biosecurity from the practitioner's perspective with the Morrison Group. And how much IS land going for in DeKalb County, IL? Sharing the details on an effort to move away from PRRS positive-unstable status. Link to"The “Holy Grail” of biosecurity: Achieving sustainable RRSV freedom in swine-dense regions"
Link to powerpoint slides "Northeast Illinois PRRS ARC The Road to PRRS Elimination?" Link to "Economic impact of filtration as an intervention to prevent PRRS introductions: A case study of a 3200 farrow-to-finish system"
Link to "PRRS virus-free production – The Pipestone System approach"